January | 2016 | Azazel's Bitz Box. With my return to work and general antipathy for painting Cavalry, my plans for my Gondor unit for the 6-month “Take of Gamers” painting challenge got diverted, even moreso since I started playing Rainbow Six: Siege this weekend. So I thought I’d spend much of this post complaining. 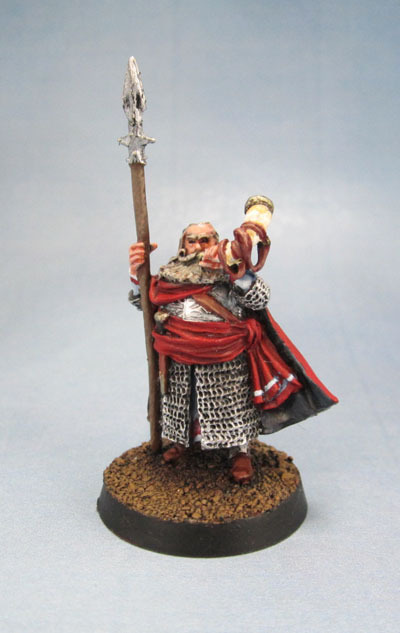 Without enough time or the inclination to finish that cavalry unit, I found another Gondor unit that satisfies the criteria: Forlong the Fat, Captain of Lossarnach. A casualty of the Battle of the Pelennor Fields, I started Forlong at the same time as I started the Axemen of Lossarnach. That is to say, roughly a year ago, and possibly a couple of months longer. As he’d been sitting on my desk for a year, he’s actually an ideal hero figure to complete for this challenge. Now, he’s not much to look at up there, but the rear view will show why it took me so long to complete. Forlong the Fat, pimping The White Tree of Gondor. Sure, it looks nice now that it’s done, but that goddamned tree is such an anti-motivator to paint. It’s a combination of all of the swirls and twirls along with the need to keep it as (close to) perfectly symmetrical as possible. 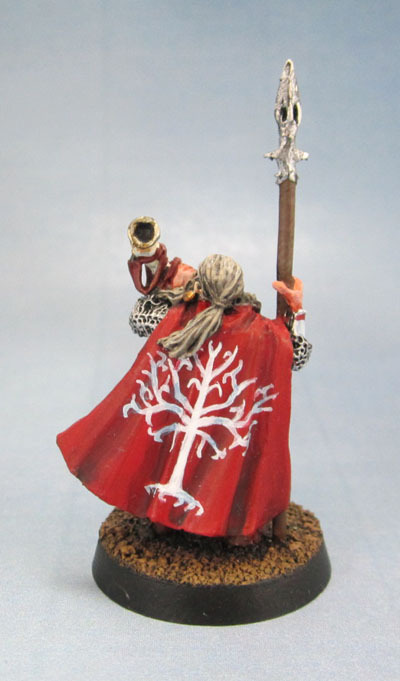 Anyway, like much of the Gondor army, it’s not that much fun to paint, but looks nice when it’s done. I still need to add the static flock once his spray varnish dries, but I’m calling him done now. January’s Painting Challenge models, completed. Like most people who backed the Kickstarter, I got my Mantic’s Dungeon Saga stuff a little while ago. While the models are (almost all) quite nicely sculpted, there’s some terribad warpage on many of them. Combined with the usual Mantic Kickstarter-quality packing (I’m still waiting on replacements for a bunch of broken and missing stuff), messed-up hardcover compendium and reviews that talk about how Jake Thornton clearly lost interest as he was writing co-op and campaign rules (apparently you can see his interest wane as you read through the Adventurer’s guide as he was really only interested in the HeroQuest-level rules) means the game’s extras got placed in a plastic tub and the game itself stacked on top to get back to one day (or not). Whatever. I’ve got Black Plague to scratch my boardgaming itch for the time being without any resentful rules being mixed in. 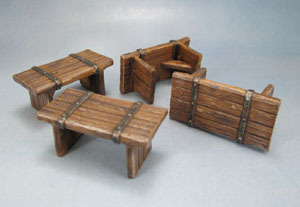 The scenery items for Dungeon Saga on the other hand, are pretty damned good. 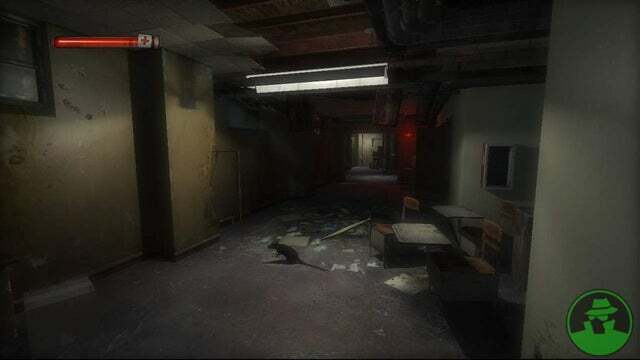 The doors are made from a proper, hard plastic (ABS or HIPS, most likely) while the bookshelves, wells, barrels, and so forth are made from a softer PVC-type plastic. Both sets are actually pretty damned good – especially for stuff that comes in a boardgame – and I’ve got no hesitation in recommending them to anyone who is a wargamer. They obviously wouldn’t work so well in super-detailed dioramas, but that’s a separate category. So I decided to start painting up a few of these pieces. Now, a word of warning. I purchased several cans of Rust-O-Leum sparay paint awhile back, since the cans read that they were a primer and colour spray in one, and that they have some kind of special formulation that binds to plastic. Great! I sprayed a bunch of my PVC scenery with it, and the stuff simply never properly dried. Even after more than a week of Melbourne’s Summer Heat. This made my “quickly knock up some scenery quickly” task a lot more painful than I’d planned. The brown eventually mostly dried, but the black was still sticky and horrible, and so I threw them into some Simple Green a few days ago. 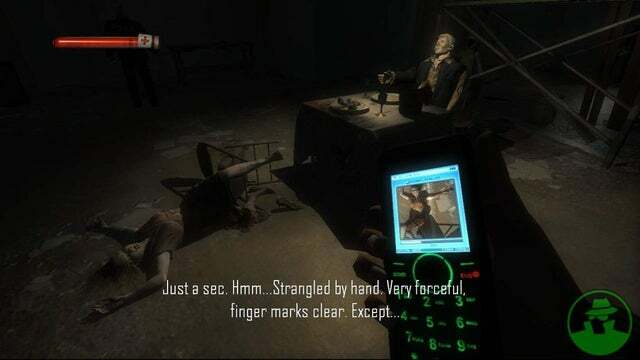 I’ll get back to those, later. 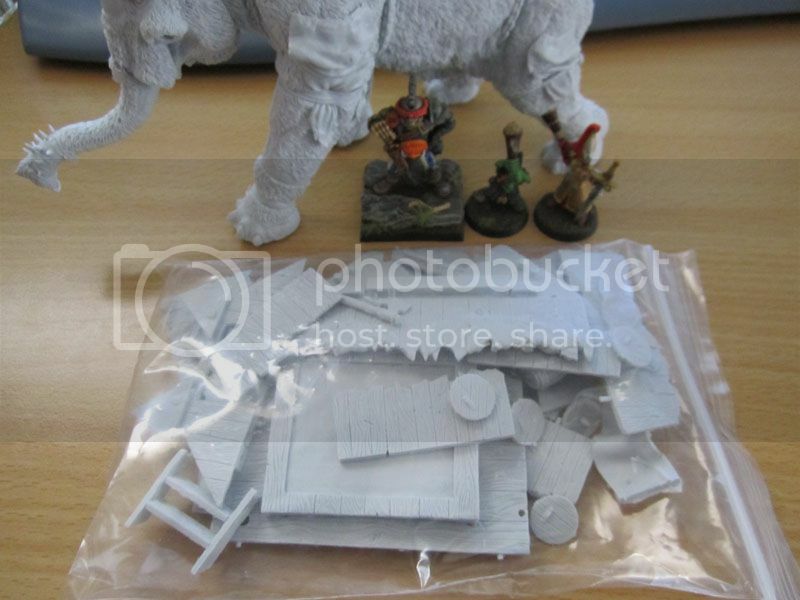 The point here being – DO NOT USE Rustoleum spray paint on miniatures. 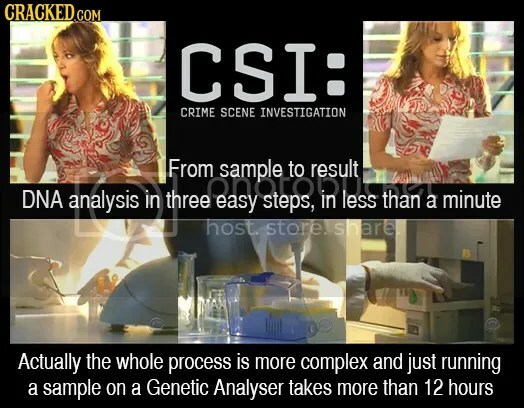 At least the formulation that they sell here in Australia. Never had a problem with other brands, and so I’m back to those. 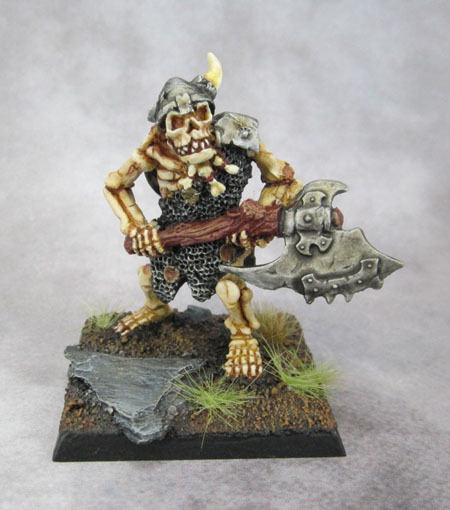 On reflection, though – it seems similar to problems that people have had with Reaper’s Bones PVC, so maybe it’s not the spray after all. 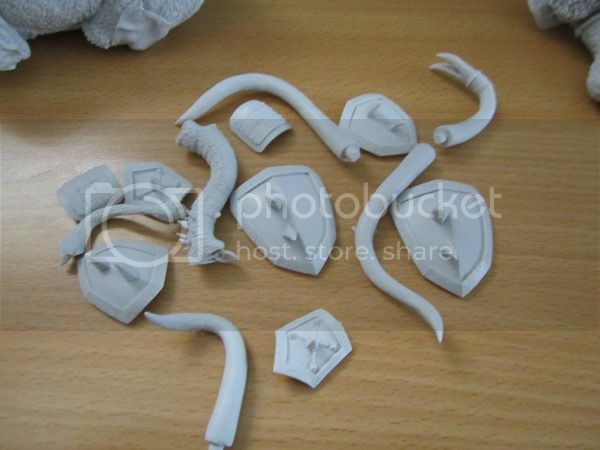 I’ll have to do some tests on HIPS sprue and some resin offcuts…. 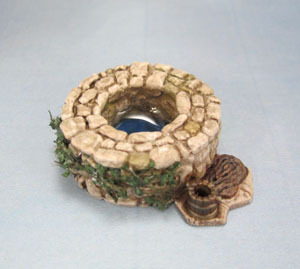 As I have three wells in hand due to buying two of the sets + extras (I’m missing more scenery, too), I had an idea as I was taking them outside to undercoat. My first thought was to paint them all “dungeon grey”/bluestone but then as I was getting out the spray primer (damn Rustoleum) I had the thought to paint them differently. One to go with my desert mat, one to go with my green mat and one to go with the dungeon internals. So this one is sandstone. I added a bit of Vallejo realistic water at the bottom of each to make them look a little nicer than just leaving the shallow sculpted bottom (which, again is quite decent for a sculpted model.) I painted the second one here as field stone. 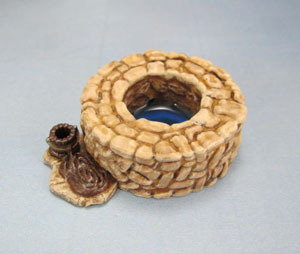 I added a bit of variation between the stones, but that seems to have mostly disappeared after washes and highlighting. I finished it by adding some plant growth around the edges, and added a little more realistic water than the desert well. And here’s the “group shot”. I’ll have to get onto the bookshelves next, since I didn’t spray those and therefore gunk them up at all. Sometime after that I’ll have to try and scrub that horrid Rustoleum off the other pieces. I’m not looking forward to that one bit. 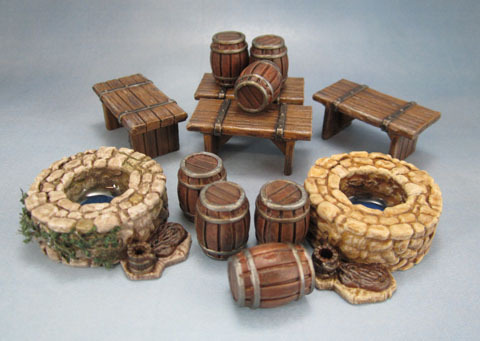 As a very exciting separate bonus – here are the Barrels and Crates from Reaper’s Bones II line. I painted these last year and photographed them because I’m now trying to photograph everything I finish, but they weren’t exciting enough to even sneak into any updates until now. So here they are. 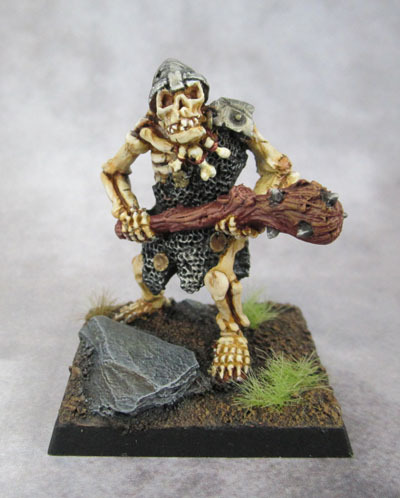 Back in August last year, I put up a post reviewing the Ral Partha Europe Undead Ogres from the Das Schwarze Auge line – Undead Ogre – Axe, and Undead Ogre – Club. I’d recently picked them up and shared my experience with ordering from RPE and showed off the figures as well as the minor conversion work I did on them. I’d originally planned to take them to work, since painting bone and metal is something I can do there with limited time and a limited palette. It never actually happened, since the models were a bit too big to find a small enough carry case for them once I’d based them on their 40mm squares. So, like so many others, they sat on my desk, staring at me for months with baleful eye(sockets). 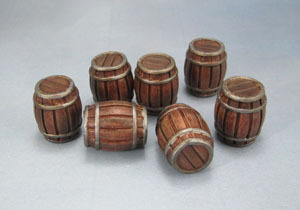 Over on Dakka, I threw together a post one night on my Plog asking if anyone wanted to join me in a “Tale of Several Gamers” type challenge to try and finish a unit per month for 6 months – and see how we do before extending it, or setting up a second one. By the next morning, there were a half-dozen people keen to come on board, and asking me when the proper thread would be started. I took this as a sign, and wrote up the “Official Post” with fairly open, flexible “rules” to get people painting, if not gaming. People just kept coming on board, and now there’s 28 people including a bunch of people I’ve never chatted to before and I’ve stopped updating the number of people in the OP. There’s not much there yet, but it did motivate me to get back on the horse with a double-challenge of both Marouda’s Undead and my own Gondor Army. I’ve even convinced Marouda to take part with the Mythological Greeks, though I’ll be contributing help to a greater or lesser extent there as well. 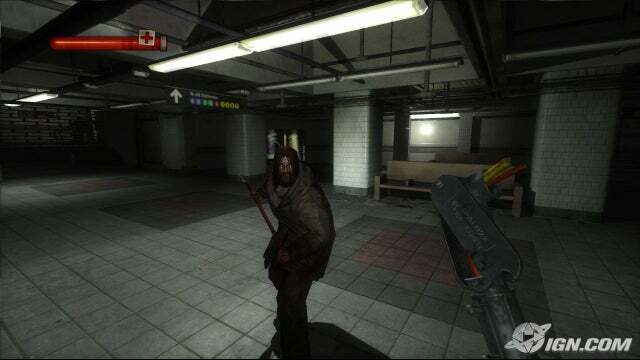 The club this guy used to wield got axed. So here they are. As a direct result of making some rules for myself in the form of the challenge, I knuckled down and finished these guys off yesterday. Mostly it was a matter of highlighting the bone, painting the shield, and finishing off the metal. Not too much, but sometimes it’s a matter of making yourself complete these things rather than an actual lot of work. 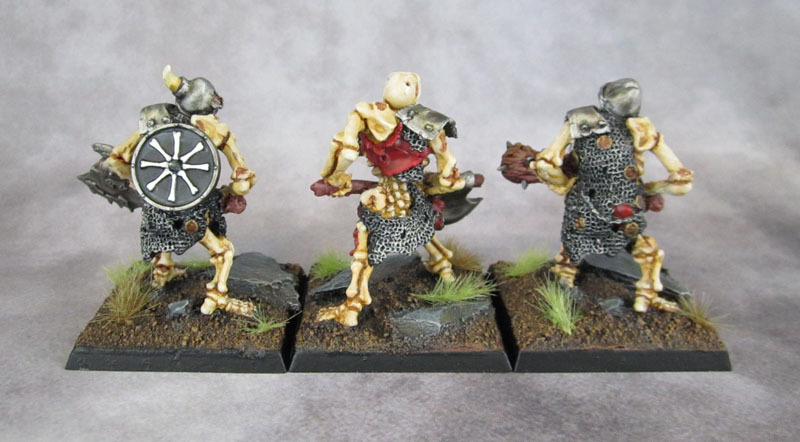 And an old Marauder Miniatures Undead Shield comes into play. 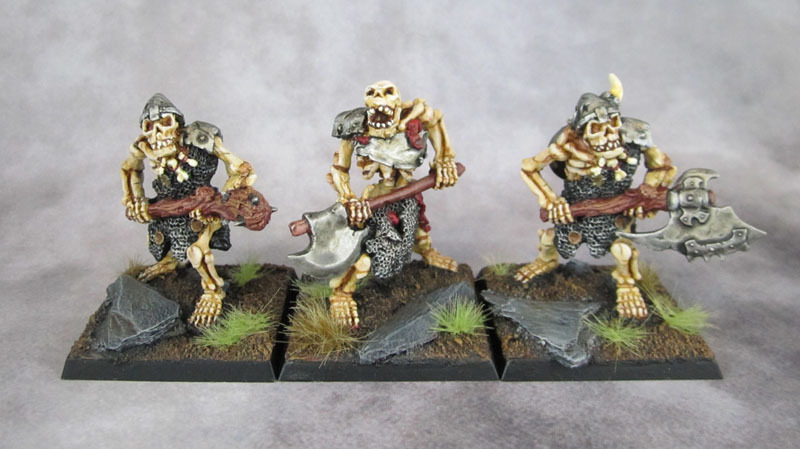 This trio will be used in Marouda’s Undead Army for Kings of War. We’ll use the entry for Zombie Trolls, since the stats fit well enough with these big fellas. Now I owe the Gondor Army a completed unit for January! 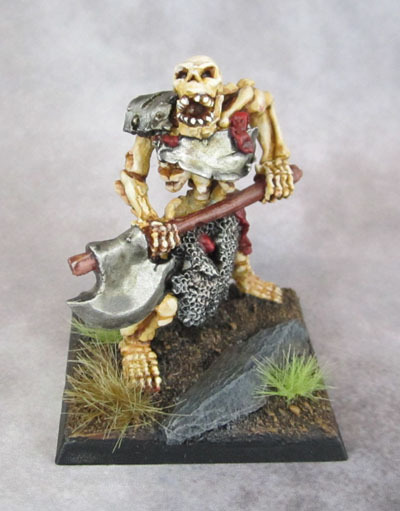 Fake edit – after I’d written up the above text here but before I photographed my models, I found that Subedai has also just finished the very same models for his Undead Oldhammer army. 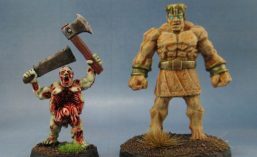 For anyone interested in using these models in Oldhammer, some stats have been created on Rab’s Weekly Digest that you’re obviously welcome to use. And so today I finally finished the second two dozen of these. The first batch had all but two wearing the bronze bell curiass – the other couple wearing a linothorax. I realised that with the limitations of the Warlord/Immortal kit there was no avoiding having a whole lot of the models simply wearing robes and a helmet. So this lot are in essence the “secondary” group of Spartans to the first. Like the first batch, these are a little anachronistic in terms of their gear, but nomoreso than most media depictions and they look decent, so I’m fine with it. As such, I went for a shield scheme that would be distinctive from the previous set, to mark them out as a separate unit. Black Lambdas on a bronze field, rimmed with red was a simple scheme to apply that also looks striking and effective. Details of the linothorax and robes. Being a mass of historical figures that will be far in excess of my “proper” Fantasy armies – and also made of figures on the low end of the detail scale, being both “historical truescale 28mm” and frankly not that detailed anyway (their feet are just undetailed hams with a hint of toes at best) I gave them as simple a tabletop job as I can stand to. I still couldn’t help going and lining the clothing of every one of them with a bit of white pattern, though. You can really only see some it from the side or behind, though. One Horde or Two Regiments. 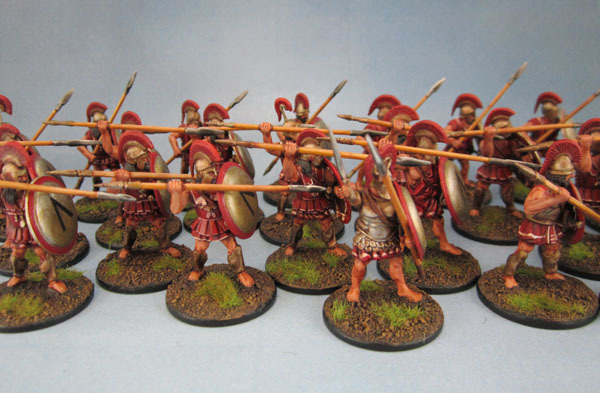 They’ll be predominantly used for Kings of War at this point, and so the 24 models make up either two regiments – or more likely a horde – of Spear Phalanx. 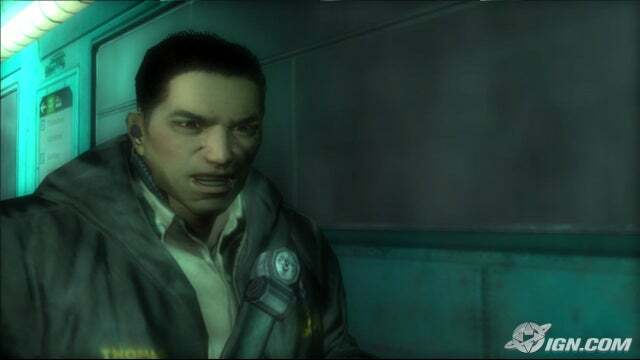 Marouda helped sporadically, but didn’t enjoy the experience, so I ended up doing much more on them than I’d planned to. I did a simple conversion to mark out the leader. Not that it matters for KoW, but I like to take the opportunity to add a little bit of character in this way. I gave him his spear to hold in his shield hand so that he could wave his sword in the air, no doubt while delivering a stirring speech or battle cry to his men. If many years of warhams have taught me anything, it’s that leaders must be shouting, not wearing a helmet, pointing, or waving something around in the air. It’s simply the rules. 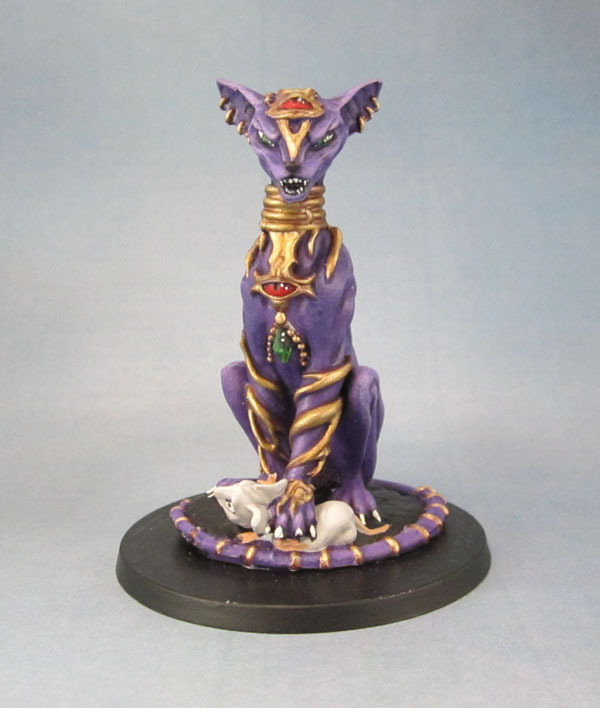 And alongside his little mate from the first unit. 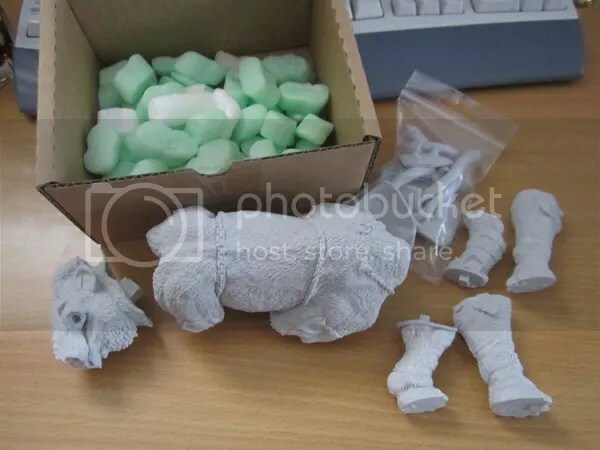 With their new Kickstarter campaign just started, I thought it might be a good time to pull out some of the booty I received for backing Shieldwolf Miniatures‘ first Kickstarter campaign – specifically the “Great War Mammooth”and share some impressions on it as a kit. I received this towards the very end of 2015, and so – like Cthulhu Wars, it’s just sat in its box until I’ve had time to look inside. With Shieldwolf’s second Kickstarter just having started this morning (my time), I thought this was an opportune time to have a look at it and snap a few photos. As it’s clearly a fantasy Mammoth, that explains “Mammooth“, I guess. Packaging is pretty simple and utilitarian. I understand that the Mammooth is going to remain a Shieldwolf webstore exclusive for at least some time, so for that kind of purpose it’s fine. The Mammooth is split into a number of pieces. The core parts – Body, head and four legs – and then the “Detail” parts. The model’s fur is traditionally sculpted, with what feels like a nice, detailed naturalistic flow. I was glad to see in hand that the fur is nothing like the CAD-sculpted “fur” resembling leaves that many of GW’s more recent kits have had. 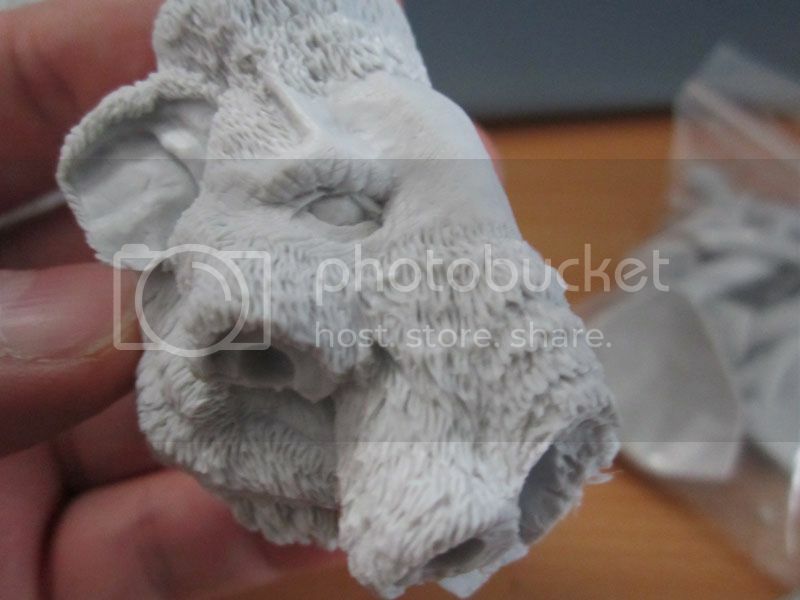 The elephantine head is also nicely sculpted. 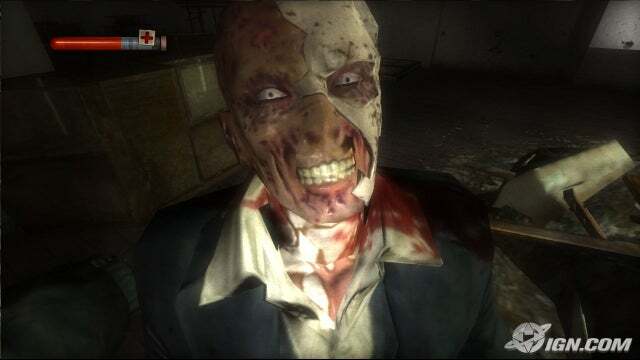 They’ve left an unfurred patch around the eyes and forehead for some reason. While I’d have preferred a full-fur face, I can live with the bare skin. 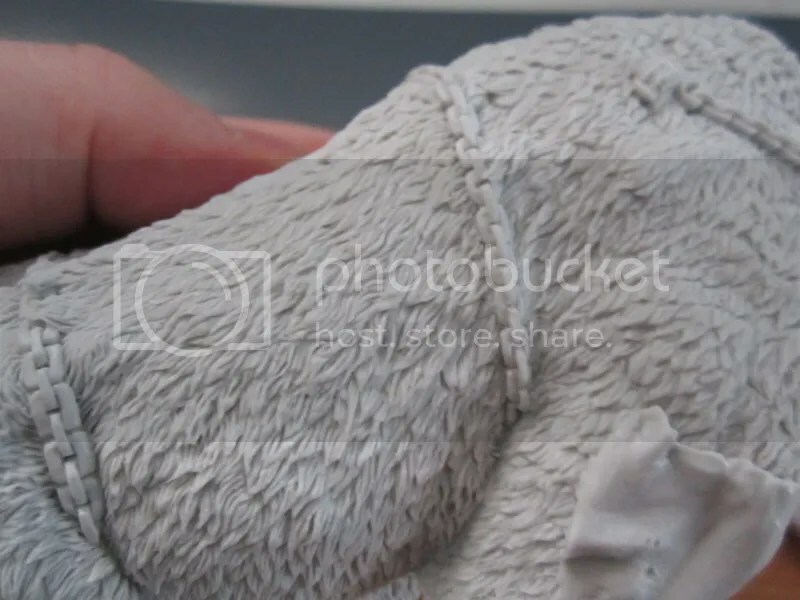 If it really bothers me, I can always try my own hand at sculpting some fur. 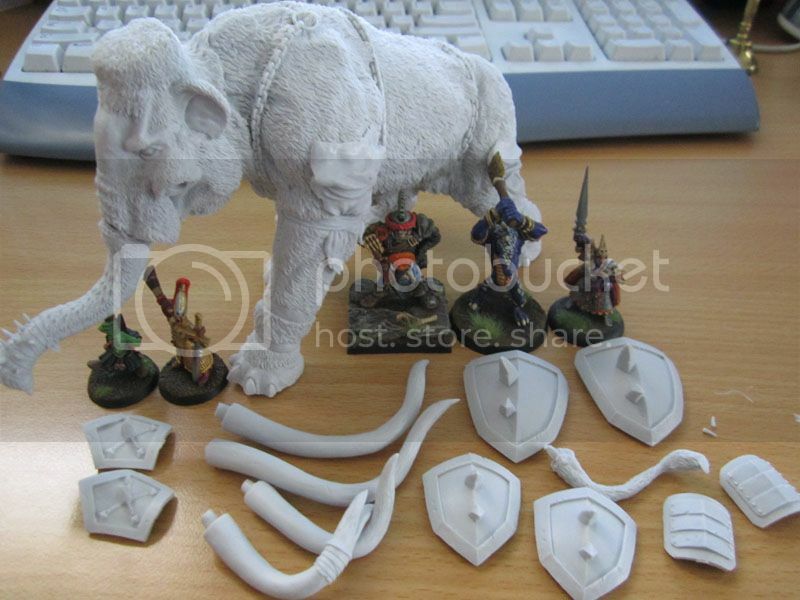 As you can see, the model comes with four tusks. Two larger and two smaller. One of the smaller one is split by design, though modifying it would be easy enough for an experienced modeller if you wanted it intact. The trunk has a number of spikes on the wrappings near the tip. 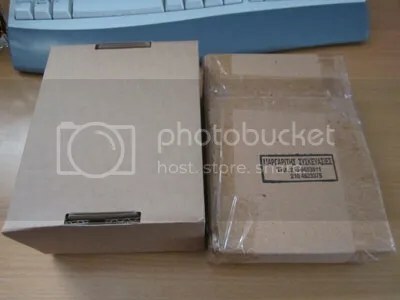 A few of my spikes were broken in transit, so it might be worthwhile for Shieldwolf to put the trunk into it’s own, separate zip-lock bag to help avoid breakage. They’re easy enough to glue back, but obviously I’d rather not need to. The “shields” look to be glued down to the shoulders, hips and shins of the Mammooth, though I could personally see mounting one of them on that bare forehead instead. As can be seen here, the Mammooth absolutely towers over a variety of other models. All of these are slightly older Citadel ones, but the size is clear to see. (L-R: Night Goblin, High Elf, Ogre, Kroxigor, Dark Elf). It’s pretty impressive in hand. I’d recommend using green stuff as well as superglue when assembling this model. Each cast join was clean and clear, but the male tabs have a roomy fit into the female sockets, so I’d bulk them out with greenstuff and superglue for a more secure and stronger fit. I usually pin larger models, but I’m not sure if I feel I need to do so with this one. I’ll be more concerned with finding an appropriately sized base for him! Shieldwolf’s website talks about having a resin base for the Mammooths coming soon, so I guess it’ll depend on what it looks like and how much it costs, since I’ve got a couple of other large models that need bases as well. The howdah comes with quite a few parts, frankly way more than I’m willing to even try to assemble for a temporary photo. I was expecting a good model, and even so I’m impressed. It’s not cheap, but it’s a huge model and will make a fantastic centrepiece for many armies. I got two and I’m glad I did. 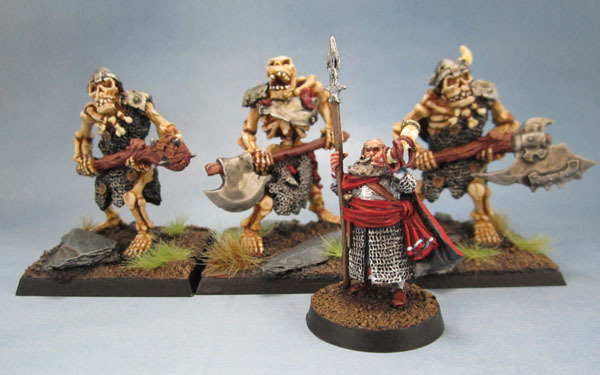 I’ll be using at least one of them in my Kings of War Ogre army, though I could see Warhammer Fantasy/9th Age or even AoS players easily using it as a better-looking Stonemaw or Thundertusk (and I don’t hate either of those models, either). 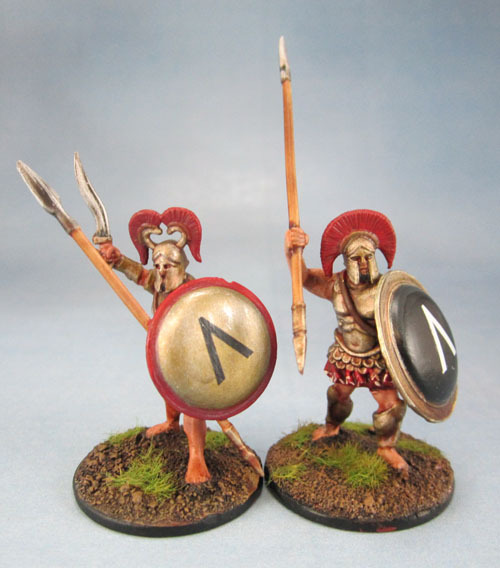 I’m down at present for that $200 Shieldmaiden Campaign army in the new KS as well. 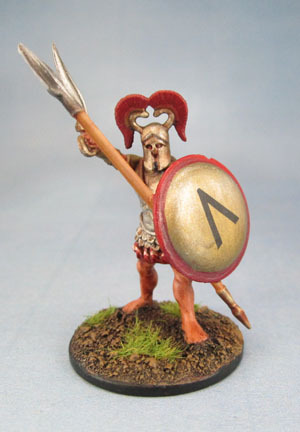 I’m keen for the female warriors that look much more like warriors instead of bikini models than is usual for wargaming, but the prospect of getting a third Mammooth certainly doesn’t hurt my interest. On their website, the Mammoth is available now as a single model, without Howdah for €100.00 or €149.50 with the Howdah. 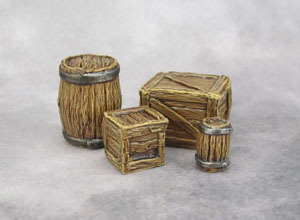 The Howdah version comes with worldwide free shipping, while it looks like the regular version uses Shieldwolf’s flat ship rate of €3.90-5.90/US$5.00-6.90/£3.10-4.70. I’m a notorious tightarse when it comes to shipping costs, but these rates seem quite reasonable to me. As noted back when I started painting this model, Raging Heroes‘ Jinx was a gift for someone. There’s a little story behind it, though – which I’ll share now. Back when the RH KS1 pledge manager was a thing, I asked a question in the chat box and was answered by Mirielle. Now at times I’ve been both a strong supporter and also a strong critic of RH (sometimes at the same time), and not been shy to take the piss, either – so this led to a couple of interesting and quite amicable chats over a couple of days. In those conversations, we talked about what we do a bit, and in there I mentioned how I worked with a young lady with ASD who is also completely in love with cats, to the point where she writes a blog based around my own cat. 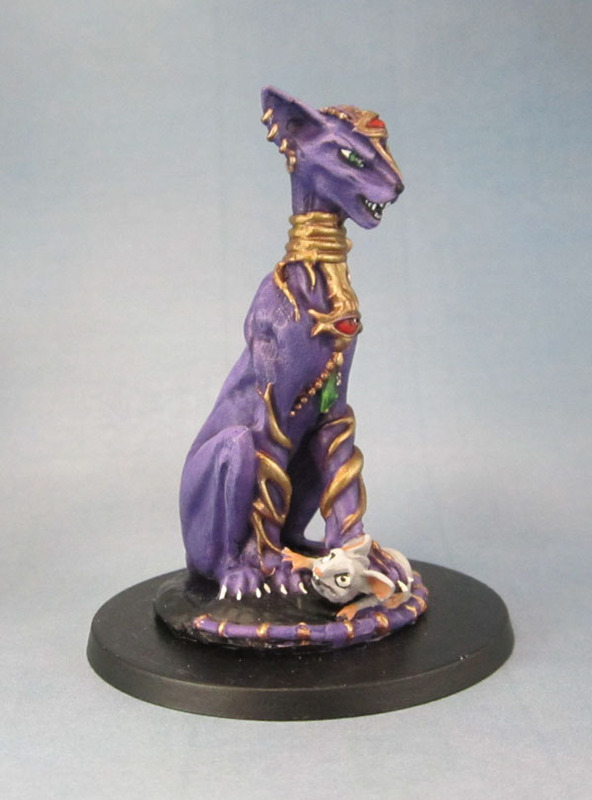 Mirielle made a very kind gesture, and offered to send out a 54mm sculpt of Jinx as a gift for this young lady. Fast forward to roughly a year later and the last wave of RH KS stuff arrived, including Jinx. There was a bit of mold slip, which I was (mostly) able to clean up on a fairly tight timeframe, as I was attempting to get it finished before the 4th of December, when the young lady finished up and moved on. Since work becomes an actual nightmare at that time of year – as I’ve referenced before – it didn’t get completed – cleaning the Trollcast resin just to get started was quite problematic, but I made arrangements with her parents to catch up with them and her over the start of the New Year. This gave me a chance to keep working on the model. Since Jinx is theoretically one of those hairless cats, there’s no fur texture. I decided not to worry about the “lore” but went instead for colours that would be acceptable in animation – something that would stand out – and so Jinx became a shorthair with purple fur. Highlighting and shading was going to be an issue with a model this big on a deadline, and I’m still far from confident with an airbrush, so I went with a very careful drybrush and wash combination, which seems to have come up quite nicely. 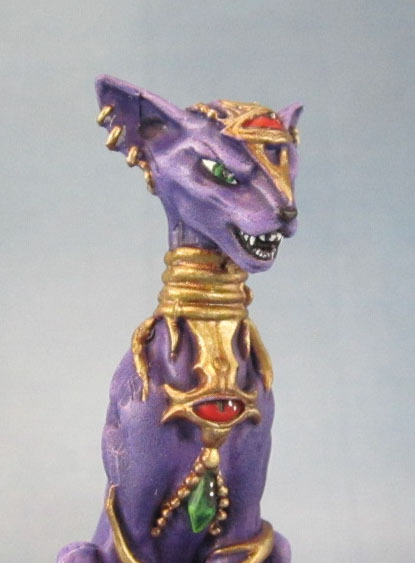 With purple, gold/brass was an easy choice for a nice contrasting colour for Jinx’ jewellery. 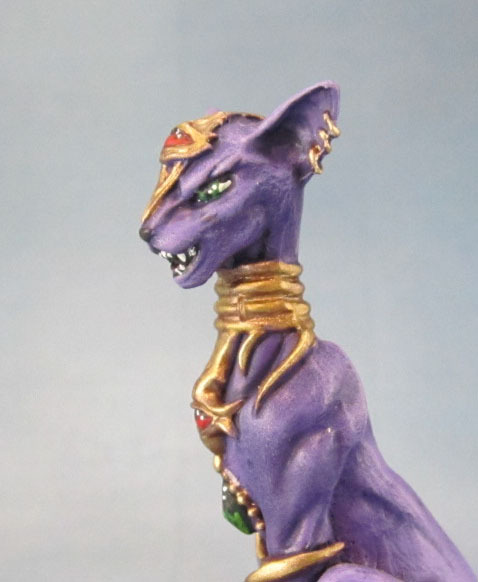 I’m sure gold jewellery could have had something to do with the choice of purple for Jinx’ fur, but at this point I can’t recall. The faint texture of the resin gives enough of an impression of very short fur, certainly on the 54mm Jinx. 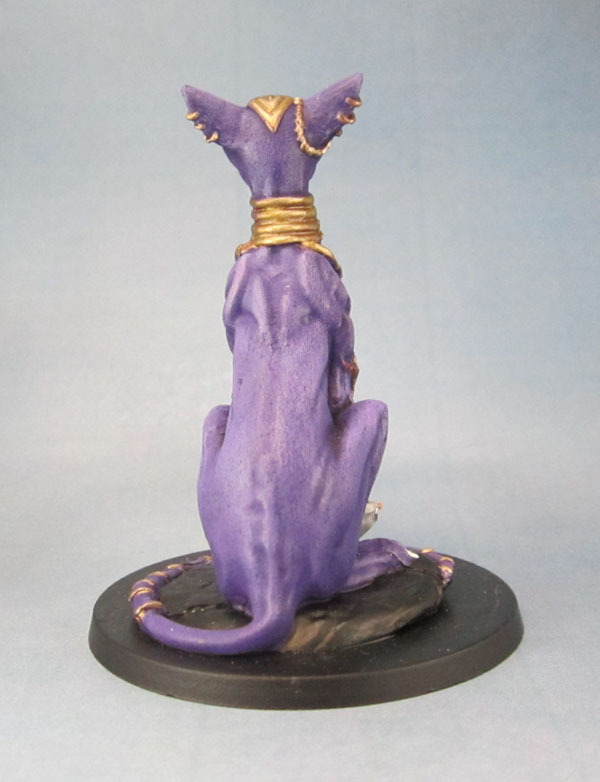 Basing was a bit of a quandry – I certainly wasn’t going to add sand and flock or tufts, since this is a shelf ornament rather than a wargame model. In the end I went for classic black. I did a little more touch-up after these photos were taken, and varnish was applied immediately afterwards. Gloss varnish on the gems, eyes, etc, yesterday morning. In the end, the large details were quite nice to paint, and not one of those painful models at all. I checked the RH webstore and it seems that the 54mm Jinx isn’t available at all. I think perhaps the 54mm Mascots were exclusives limited to the Kickstarter campaign/backers? 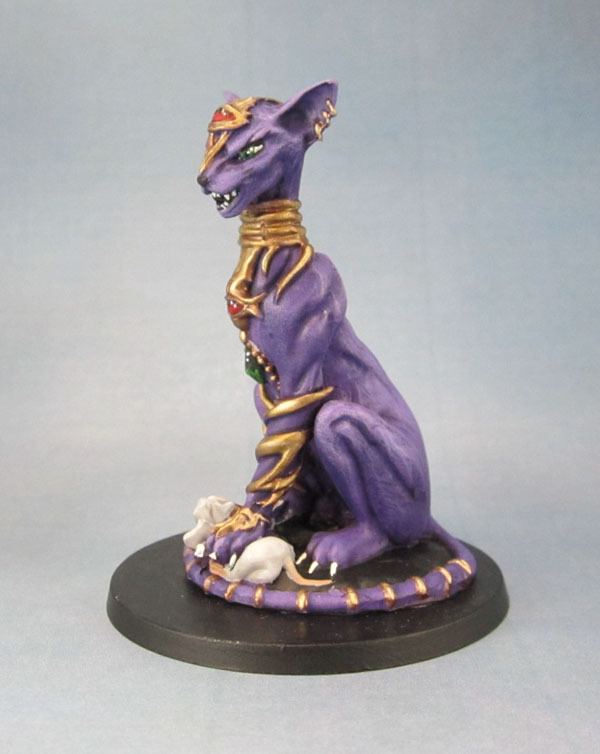 Most importantly of all, when I presented the model to her yesterday she was absolutely delighted and it was immediately decided that Jinx is an Egyptian Cat. Her parents were also touched by the story behind it, so a warm thank you again to Mirielle and Raging Heroes from the young lady, her family as well as myself.